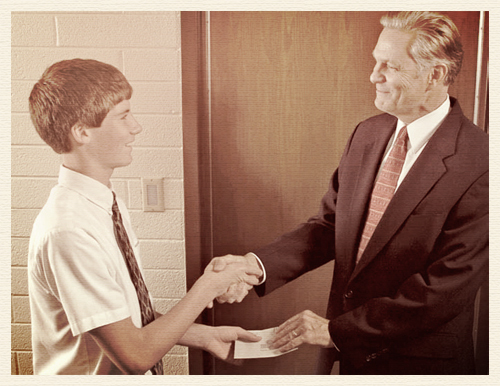 Modern Mormon Men: MMM Library: Is Tithing the Same as Giving to Charity? To me, no, not even close. Is tithing tax deductible as a charitable donation? Yes, but I would argue that, in general, tithe payers are not writing their tithing checks as a charitable gift (I pay mine online, are checks still a thing?). The Law of Tithing is a religious commandment of obedience and sacrifice. It is in place to not only show the faithfulness of the members, but also as one of the main monetary resources the church has to help build the Kingdom of God. It is the expectation that fully active members pay ten percent of their income to the church that excludes it from being actual charity. Members of the church are required to be full tithe payers in order to participate in temple ceremonies and to hold specific callings in the church. On the other hand, paying a fast offering is specifically designed as a charitable contribution to help those who are in need. But tithing and fast offerings are completely separate in both the motivation in giving, and its use. In my personal experience, the act of paying tithing is not done with the mindset that I am being charitable; rather it is done with the mindset of being obedient. But when I am paying a fast offering, I am in the mindset of knowing this money will help someone else. Thinking of tithing as a charitable contribution actually diminishes the motivation behind writing the check, and demeans the intent of the law. This post was originally published August 23, 2012. Some updates were made in reference to dates. Kyle works in Democratic politics, yet somehow his bishop still lets him participate in church activities. He hails from Washington DC, but is embarking on a year of living in Salt Lake City and being a stay-at-home dad, while his amazing wife brings home the bacon. Actual bacon. No, seriously, she works across the street from a grocery store. It's delicious. Kyle's Mormon street cred comes from the fact that he is the youngest of seven children and is only five years older than his niece. Twitter: @KJinDC.